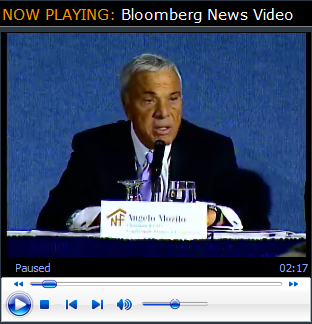 Geez, you only have to get about two minutes into this video from Bloomberg before you realize how screwed up the housing and credit markets really are as the head of the nation's largest mortgage lender explains the cause of the current problems. Following the group therapy session hosted by the Treasury Department where more details of the "Subprime Rate Freeze" were hammered out, Angelo Mozilo was asked by moderator Maria Bartiromo where we are in the current housing cycle. I don't know where we are in the cycle. I wish I did. But I think we're dealing primarily with the results - and I think all these (Treasury Department) initiatives are very important to avoid foreclosures - but I think we're clearly dealing with the results and not with the cause. Nobody's addressing the cause and that's what has to be addressed ultimately and that's the fact that values of homes continue to go down and as they go down, the problem gets exacerbated. And until we stop that cycle, we'll continuously be dealing with this break in the damn. And the cause in the deterioration of values is the lack of liquidity. Honestly, say what you want about what can or should be done at this point, but don't insult the audience's intelligence by talking about falling home prices being the cause of the current housing and mortgage mess. Home prices in many parts of the country are still at levels that only make sense when you are in the middle of a speculative bubble and we are clearly past that point, now dealing with the aftermath of one of the largest speculative bubbles the world has ever seen. Falling home prices as the cause? I also have seen the interview he gave on CNBC. A forensic expert would say that he is both dishonest and misleading with his answers. What a crook! He's just trying to throw the SEC off the trail in their stock sale investigation by demonstrating how clueless he really is. So if we can just get housing prices to stop falling, all will be okay. How is that to be done? By lowering interest rates, of course! There is this chorus of morons calling for lower interest rates. All they can focus on is saving housing and boosting exports. Fine. But they are not thinking this all the way through, are they? I don't know if I can stand to watch the greedy lizard. His whole agenda is to prop up the housing market with whatever it takes: lower interest rates, having Fannie Mae underwrite jumbo-ier loans. it's disgusting - america already subsidizes housing wayyyy too much. yuk..he kissed her when he came onstage. Is it contagious? "I don't know where we are in the cycle." Why the ! @*% is he the CEO? His problems are bigger now than just trying to keep the sham market inflated and *liquid* as he likes to say. He is putting on his dunce cap in hopes to avoid prosecution. Why is this man not in jail? I'm concerned that his tan is fading.